BIO Marché has been partnering with organic farmers since 1983—more than 30 years. It is our honor to support both organic producers and our customers throughout Japan. We deliver on a set day every week, depending on your postcode. Your local BIO Marché staff will deliver between 9am and 8pm. If you have a regular order, you’ll notice that delivery tends to be at a similar time every week – traffic and weather permitting! 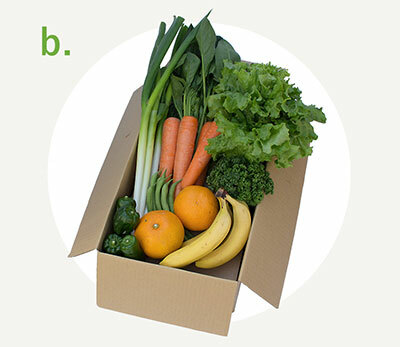 You can either order a box with previously selected vegetables and fruits (hereinafter called the “vegetables box ") or you can choose any of the products (vegetables, fruits, dairy products, meat, fish, detergents etc) from the catalogue yourself. Please fill in the order number on the order sheet. 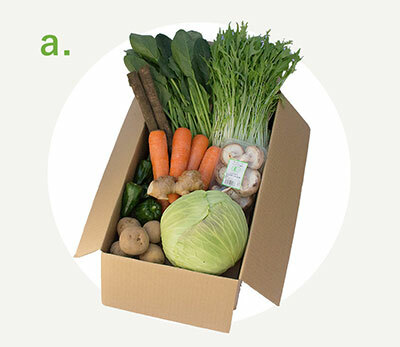 If you order vegetables box with previously selected vegetables, the shipping is FREE, after you order the box you can add other products from the catalogue on the order sheet. If you choose your own products you will be charged a shipping fee of ￥500+tax. *the catalogue YUKI:kun is in Japanese only, sorry. Our vegetables boxes are filled with the freshest and most seasonal organic products from farmers we know and trust. You can get our organic products on a regular schedule. You can choose from 4 vegetable boxes. 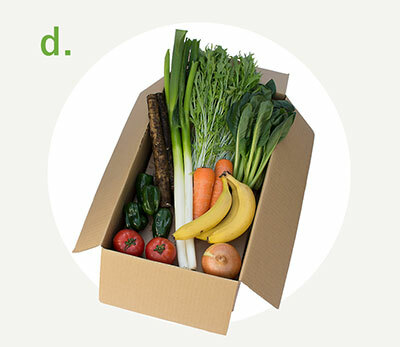 The vegetable products included in the boxes are seasonal and the content may vary every week. Try a few different boxes to see what works best for you and your family! Please write the other box number that you need the next week on the order sheet. We also have a more convenient delivery service for you: Just sign up and automatically receive your selected products every week! No hassle! For details, please refer to the attached sheet “Automatic Ordering System”. 9 different types of seasonal organic vegetables specially selected each week. 7 different types of seasonal organic vegetables with 2 types of fruits specially selected each week. 6 different types of seasonal organic vegetables with 6 free-range eggs and 1 fruit. 7-8 different types of seasonal organic Vegetables in small portions with 1or 2 types of fruits. we can pick up your next order on the delivery date, so please hand it to the delivery person, or leave it in the used-box. If you were not able to hand your order sheet to the delivery person, you can still make your order by FAX or E-mail until 12pm (noon) the next day. If you wish to change your order (add or remove items), the Cut-off Time & Day is same as stated above. 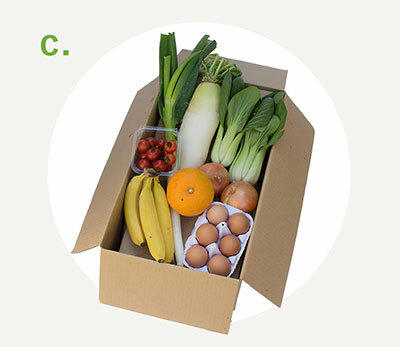 If you wish to cancel the delivery of the vegetable box or the products from the Automatic Ordering system, the Cut-off Time & Day is same as above. Please tell us the date you want to cancel by e-mail (mail.ebio@biomarche.jp). Also when you are going on Holiday, please tell us the dates by E-mail and we won't deliver to you until you are back. We deliver to many locations in Japan—especially in the Tokyo area. Nobody needs to be home; we'll simply leave it at your door or in your home delivery box. Please do not throw away the box, we will pick them up on the next delivery day. *FREE! =on orders of vegetables boxes! The billing amount is withdrawn from your credit card once a month. *The following credit cards may be used. Payment of your deposit and annual membership fee are required at the time of enrollment. We will use your annual fees not only to provide you with information on our products but also to support organic farming in Japan, allowing our producers to enhance their organic technology to enable them to continue to deliver safe and high-quality organic vegetables right to you. *These fees are charged from your bank account at first billing date. ¥2,000 yen deposit will be refunded, if you cancel your membership. 2 We will inform you regarding delivery dates and your membership ID number as soon as your enrollment has been processed. Don’t forget that we are always here to help. If you need any assistance at all, please don’t hesitate to send us an e-mail. Business hours : Monday-Friday 9.00 a.m.-6.00 p.m. Copyright © ビオ・マルシェの宅配 All Right Reserved.